Gochujang (Korean: 고추장, IPA: [kotɕʰudʑaŋ] Koryo-mar:кочхицай/кочхидян (regional)) is a savory, spicy, and pungent fermented Korean condiment made from red chili, glutinous rice, fermented soybeans, and salt. Traditionally, it has been naturally fermented over years in large earthen pots outdoors, more often on an elevated stone platform, called jangdokdae (장독대) in the backyard. Its HS code is 2103.90.1030. According to the Jeungbo Sarim gyeongje (증보산림경제, 1765), gochujang was made by adding powdered red chili peppers and glutinous rice powder to soybean paste and aging this paste under the sun. This recipe is similar to the recipe used today to make gochujang. Sunchang County is famous for their gochujang. Gochujang is strongly rooted in traditional daily life in Korea. Both commoners and nobles used gochujang as an indispensable source of food and nutrition. China and Japan, the countries with which Korea has historically shared the most culture and trade, do not include gochujang in their traditional cuisines. However, the first known record of Gochujang is in a Chinese document called Sikui-simgam (食醫心鑒), and appears as Chojang (椒醬). The record explains that people in ancient Korea commonly ate Gochujang with boiled chickens, Doenjang, green onion, and ginger, and that they believed it to be highly nutritious. Similar content was found in several other historical documents in China, such as a tenth-century document called Sasi-chanyo (四時纂要). Additionally, a book from the late 14th century, Siknyo-chanyo (食療瓚要), explained that people who had a weak stomach or symptoms of a stroke would often eat gochujang or chicken braised with gochujang to combat symptoms. Hangyank, Korean traditional medicine (鄕藥), recommends eating soup made with Gochujang to treat weakened stomachs. Gochujang's primary ingredients are red chili powder, glutinous rice powder mixed with powdered fermented soybeans, and salt. Major substitutes for the main ingredient, glutinous rice (chapssal, Korean: 찹쌀), include normal short-grain rice (mepssal, Korean: 멥쌀), barley, and, less frequently, whole wheat kernels, jujubes, pumpkin, and sweet potato; these ingredients are used to make special variations. A small amount of sweetener, such as sugar, syrup, or honey, is also sometimes added. The finished product is a dark, reddish paste with a rich, piquant flavor. The making of gochujang at home began tapering off when commercial production came into the mass market in the early 1970s. Now, most Koreans purchase gochujang at grocery stores or markets. 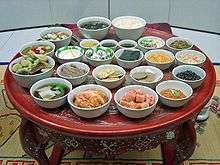 It is still used extensively in Korean cooking to flavor stews (jjigae), such as gochujang jjigae; marinate meat, such as gochujang bulgogi; and as a condiment for naengmyeon and bibimbap. Gochujang is also used as a base for making other condiments, such as chogochujang (Korean: 초고추장) and ssamjang (Korean: 쌈장). Chogochujang is a variant of gochujang made from gochujang with added vinegar and other seasonings, such as sugar and sesame seeds. It is usually used as a sauce for hoe and hoedeopbap. Similarly, ssamjang is a mixture of mainly gochujang and doenjang, with chopped onions and other spicy seasonings, and is popular with sangchussam (Korean: 상추쌈), which is a lettuce wrap of grilled meat, sliced garlic, green chili peppers. and other vegetables. Gochujang is used in various dishes like bibimbap and tteokbokki, also in salads, stews, soups and marinated meat dishes. Gochujang makes dishes spicier (contributed by the capsaicins from the chili), but also somewhat sweeter. 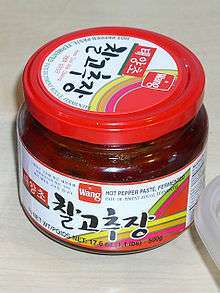 ↑ Gochujang is also romanized as gochoojang, gochuzang, gochoozang, or simply "hot bean paste". ↑ 고추장 (in Korean). EncyKorea. Retrieved 2013-04-19. ↑ "Sunchang Gochujang Village (순창전통고추장마을)". Korea Tourism Organization. Retrieved 19 April 2013. ↑ Gochujang (Korean red pepper paste): A Korean ethnic sauce, its role and history. ↑ "Gochujang (Hot Pepper Paste)". visitkorea.org. Retrieved 2013-04-19.